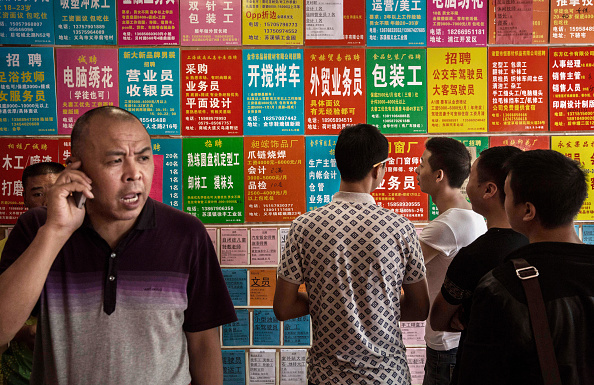 Chinese men look at bulletin boards showing potential jobs outside a job center on September 18, 2015, in Yiwu, Zhejiang Province, China. A slowdown in manufacturing and exports in China is causing global concern that the world’s second largest economy is running out of steam. By Wang Ran, the founder of Beijing private investment bank China eCapital. This article was first published by Caixin. Not a single, modern-day entrepreneur or investor in China has had to experience a substantial and painful economic slowdown, let alone a recession. The reason is simple: Since the nation’s reform and opening campaign began in 1978, China has never faced such situations. China’s average gross domestic product growth rate was 9.74 percent between 1980 and 2015, according to the National Statistics Bureau. The annual compound growth rate during the same period was 9.76 percent. For brief periods, annual GDP growth fell below 5 percent in 1989 and 1990. But it exceeded 7 percent annually before falling to 6.9 percent last year. The future will probably be a lot different. Warning signs indicate China’s economy has probably entered a relatively long downturn period. GDP growth will probably fall to 5 percent, 3 percent, or even lower. Some industries may even see zero or negative growth. For entrepreneurs and investors, this will be a sea change because assets will have to be reassessed and business values rewritten. Many U.S. dollar-denominated investment funds started revising their assessments of Chinese companies, including start-ups, about 18 months ago, and subsequently slowed the growth of their investments. But many Chinese entrepreneurs and some investors have so far failed to reassess their own businesses and investments. At China eCapital, we have been telling our clients since May that the move by the China Securities Regulatory Commission to tighten regulations on Chinese companies that plan to delist from a U.S. stock market will profoundly impact business valuations. The uncertainty facing companies looking to relist on the mainland will prompt some investors that rely on leverage to unload their shares, thus dealing a fresh blow to business valuations. Since modern-day investors in China have never experienced a complete economic cycle, which includes expansion and contraction, I’m afraid that paranoia will result. They lack experience in dealing with economic downturns. Large amounts of capital will thus flow out of risky industries and into relatively safe sectors. If that happens, new entrepreneurs will find it harder to raise funds, and their businesses will more likely fail. Examine your growth target for the next two years as soon as possible, and make adjustments if needed. If you are raising funds from investors and the business valuation does not matter much to you, clinch the investment immediately. If you are not looking for investors right now but will consider doing that within the next six to 12 months, start tomorrow. But make sure that you’ll have on hand enough funds for two years’ worth of operations, even if you will not seek investors. Focus on cash flow rather than profit margins. Focus on profit margins rather than revenue scale. Focus on revenue scale rather than gross merchandise volume. Focus on financial safety rather than following a growth curve. Emphasize assets that can be used as collateral. They will play a surprising role at crucial moments. If you are thinking about starting a business, you should avoid industries that require huge sums of money at the outset—and might burn money over a long period—unless you or someone on your team has a very strong background. Such a background could include experience as a software engineer at Google, Facebook or one of the BAT companies. Instead, you should focus your attention on sectors that are not easily influenced by economic fluctuations, for example the basic consumer goods sector. Pay close attention to U.S. dollar-denominated investment funds and general partners with experience in managing U.S. dollar-denominated investment funds. Over the past two years, big corporations, A-share companies, financial institutions, wealthy families and even celebrities have replaced these funds as the dominant investors in China. In the years to come, though, the market will change. Big, international, U.S. dollar-denominated investment funds will probably become important investors again because they have extensive experience in handling investments amid an economic downturn. I urge every investor and entrepreneur to contemplate one question this summer: What can you do to survive and even thrive if, over the next five to 10 years, you face an environment marked by low growth rates, negative yields, a depreciating yuan and rising levels of bad loans held by Chinese banks? If you’re well-prepared, you can turn what will be a crisis for others into opportunities for yourself.